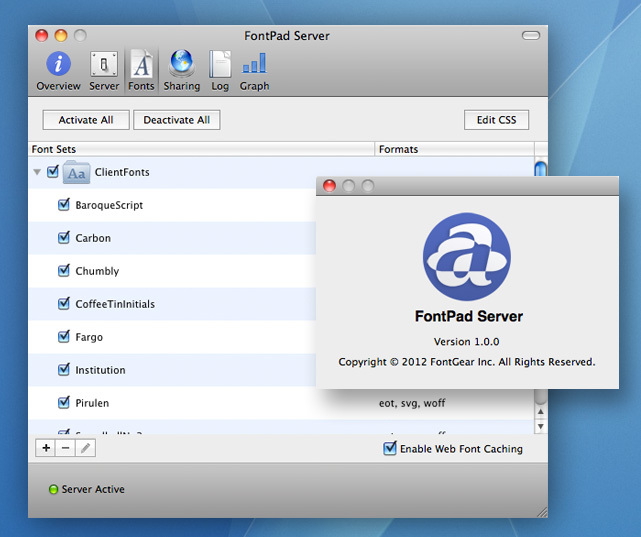 FontGear Inc. announced today the first release of FontPad Server. FontPad is an internet server that manages web fonts. FontPad Server provides a safe, controlled, and protected way to serve your own web fonts through an industrial-strength software solution. Built exclusively for serving web fonts, FontPad Server includes all the features you need to take control of your valuable web fonts assets. FontPad Server allows you to specify exactly which internet domains are allowed to use your web fonts, and which font sets are used on allowed web pages. Industry standard secure technology serves encrypted font data to the internet and eliminates hackers and leaches looking to rip-off your valuable font files. To use FontPad Server, web page designers include a simple CSS link in their web pages that automatically requests web fonts from your domain (not a font-rental service). FontPad Server includes all the features you would expect from a professional server, including customizable Page Not Found (404) response, support for HTTP and HTTPS, domain blocking and control, data throughput graphing and activity logs, and more. This entry was posted on February 21, 2012, 10:01 am and is filed under Font Related, Software, Technical, Technology. You can follow any responses to this entry through RSS 2.0. You can leave a response, or trackback from your own site.